The days are getting shorter and the temperatures are slowly sinking. Now is the time to keep an eye peeled for fungus. Especially Brown Patch. Brown Patch will affect all types of grass but really likes St Augustine. 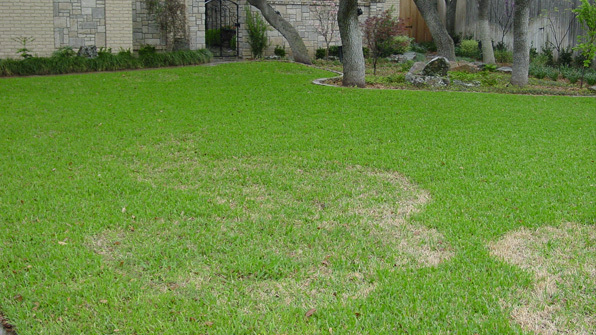 The best ways to prevent Brown Patch (other lawn fungus as well) are modifying the way we fertilize, water, mow and maintain the mower. You should have already fertilized but if not stay away from water-soluble nitrogen (fast release), instead look for water-insoluble nitrogen (slow release or time release). During cool weather we should only water in the morning and never in the evening. This also goes for spring. At the first sign of brown patch start bagging the lawn. The final step is mower maintenance. (Important safety tip to follow) With the mower turned off spray the tires, blades and under side of the deck with a 50% mixture of water and bleach. This will kill any attached fungal spores and keep it from spreading. Let it dry for about 20 minutes and you are good to go. Detecting a fungal problem early makes it much easier to cure. Proscapes Lawn and Tree care lawn maintenance service can help you with your lawn care. Contact us below. Stay in touch with us! Find out the latest on keeping your lawn looking healthy and green.